Alright, it’s time for our next trip back in time. Lean back and enjoy! 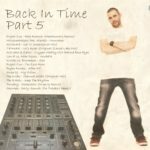 This entry was posted in Back In Time, Podcasts and tagged Hardstyle, iTunes, Mix, Tracklist by mahe. Bookmark the permalink.